In cooperation with Werkstattkino Munich. What do have women poets and musician in common? To begin with, there are films about them but they are seldom screened.Therefore for two days female presence film festival presents a selection of films rarely or never shown in Munich or German cinamas. Schamrock traces poetic and autonomous messages of women poets and musicians that can be found in mostly unknown films generally neglected by popular media. Seven documentaries and feature films Sieben Dokumentar- und Spielfilme provide a close look at the lives, works and production conditions od women artists from various backgrounds and different times. They tell about courage, resistance and self-empowerment and poetray the development of independent forms of artistic expression within a male dominated cultural landscape. 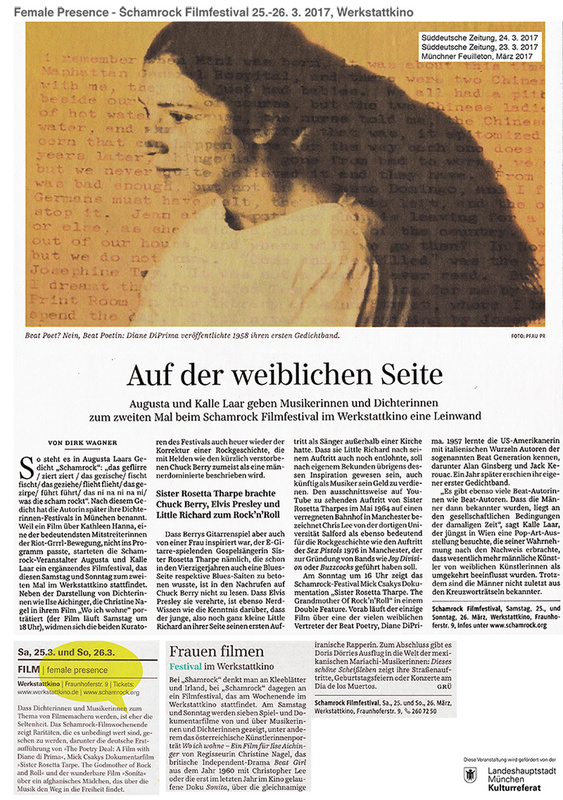 The festival shows films about Austrian poet Ilse Aichinger, beat-poet Diane di Prima, Singer and seminal guitarist Sister Rosetta Sharp, iranan rapper Sonita, the grunge- und Riot Grrrl scene in the USA at the begnning of the 1990s, and the rare "trash classic becomes arthouse" Beat-Girl of 1960. And finally, Doris Dörries gives an introduction into the world of women mariachi musicians in Mexico City. The attitudes and remarks of the artist do not represent a feminism that got stuck in theory, but demonstrate living examples of the struggle for equal rights and independence. For that we are looking for current examples as well as materials on predecessors, who are not necessarila part of a particular movement, but whose (real or film-fictional) lives remain constant sources of inspiration.